Want washboard abs and train them at home? Here are the exercises to do it! But don’t neglect the word of warning at the end! Let’s start with a look at your ab muscles, so you have an idea what you are training there. There is a quadrillion muscles in that area, but two are important for a nice definition. The first is the rectus abdominis, that runs from your ribcage to your pelvis. The second are the obliques, that start around the ribcage and go down to the sides of the hip bone. 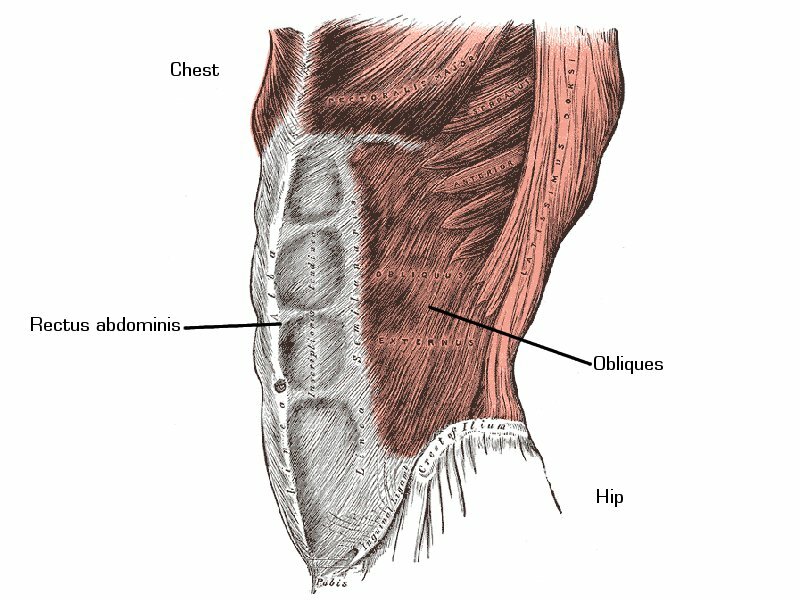 The rectus abdominis and oblique ab muscles. The uncrowned king of ab exercises is the crunch. Key with these is to fixate a spot above you and to not pull on your head. To get the obliques, all we have to do is a slight variation of the regular crunch, the “twisted” crunch. With three exercises you can train both the rectus abdominis and the obliques at the same time. The first two are the regular and the side plank, the third is the standing leg raise. That one you can even do when brushing your teeth! A lot of people still do sit-ups, but for your ab muscles they don’t do all that much. Because they mostly train the hip flexors, deep muscles you won’t ever see outside of doing an autopsy on yourself. I mentioned a word of warning in the beginning. Here it is: ab exercises alone won’t get you a six-pack! For a more in-depth explanation, check this link right here. Also have a look at the 11 bad ideas that can cost you your six-pack! I agree these are all fine, but I do it differently. I keep my arms on my chest or at my sides rather than behind my head. Do you think leg exercises are just as good as upper body movements for the abs? I do crunches and V-ups, but mostly I do high karate kicks as well as leg lifts with bent knee with my arms holding me in the air off the edge of a bench. Klar? Do you think that is as good? The most involvement from the ab muscles you’ll always get with exercises isolating it, like crunches. However, as a martial artist you are better advised to train the abs in context. Hi, Evil. I really find your website very helpful. Keep it up!! My question is that which careers and involved if you want to stay in health fitness? Gyms and fitness centers often look for employees who are into fitness and often don’t require you to have a lot of qualifications. That’s the easiest way into a fitness career, but also one with low pay and possibly a dead end. I advise you to get a certification from a reputable organisation (for example, ACSM or ACE) or get a college degree in exercise physiology. Then you have a wide choice of fitness career moves.